Justin can eat eggs for breakfast every single day and not get bored, but I can’t say the same. I get tired of eggs, and we also hear from you guys that you’d like some egg-free options. 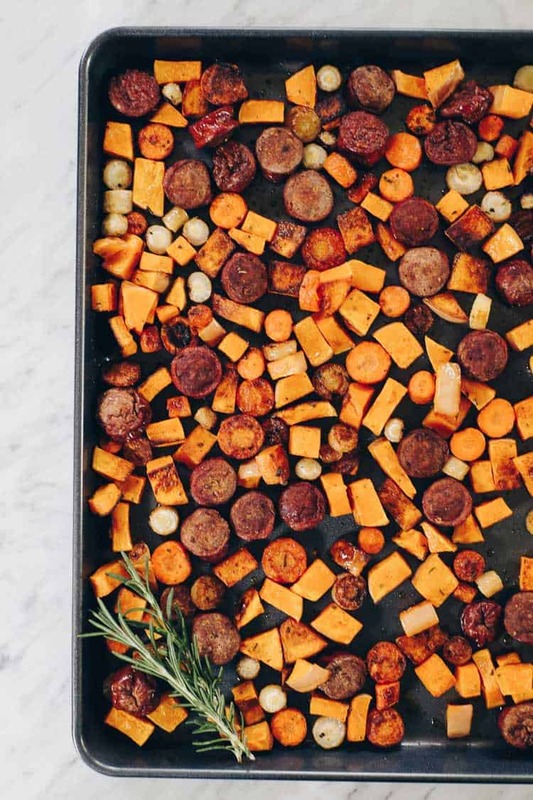 So, this sheet pan roasted sausage and vegetables recipe is for you! Whether you have an allergy or intolerance to eggs or just want to mix things up, get ready to enjoy this flavorful one pan dish! We love simple meals that come together easily. This sheet pan roasted sausage and vegetables recipe is SO simple and easy to make! You just prep the ingredients real quick and throw them all on a sheet pan. Let the oven do the work and enjoy! Once you pull your roasted sausage and vegetables out of the oven, make it a bowl! We love to enjoy most of our meals in a bowl. For whatever reason, everything just tastes better and feels more cozy when you load it up in a bowl. 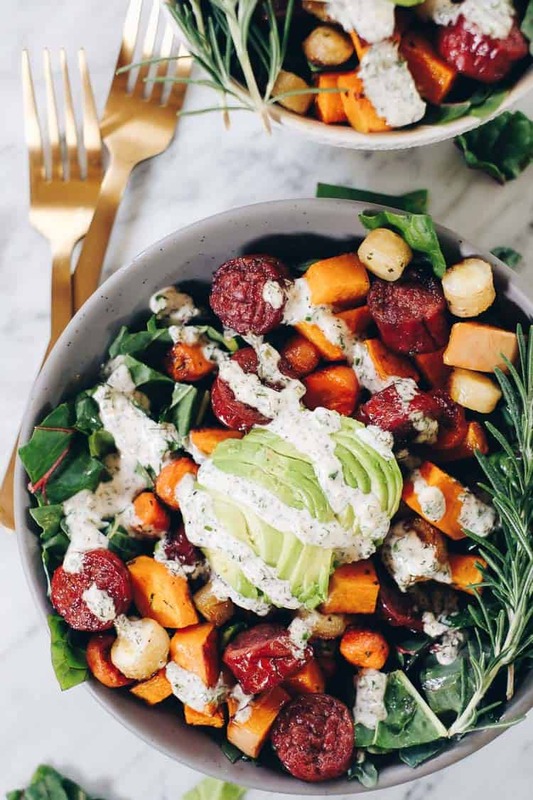 Start with a bed of greens and then layer the hot roasted sausage and vegetables right on top. The heat of the dish will wilt the greens a bit, which I love! Next up is the creamy ranch. Probably the best part of this recipe is that you get to drizzle creamy ranch all over it! Did you know that homemade ranch dressing is not only a breeze to make, but also so much more delicious and creamy! 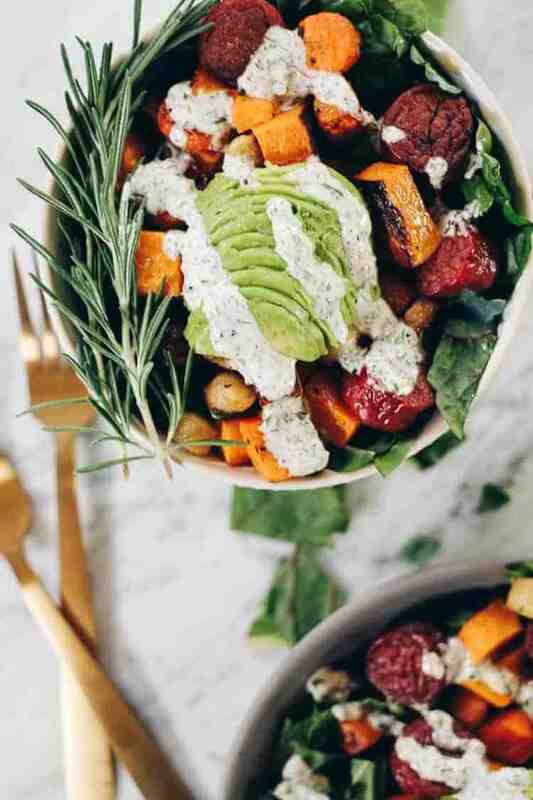 We love this ranch dressing. 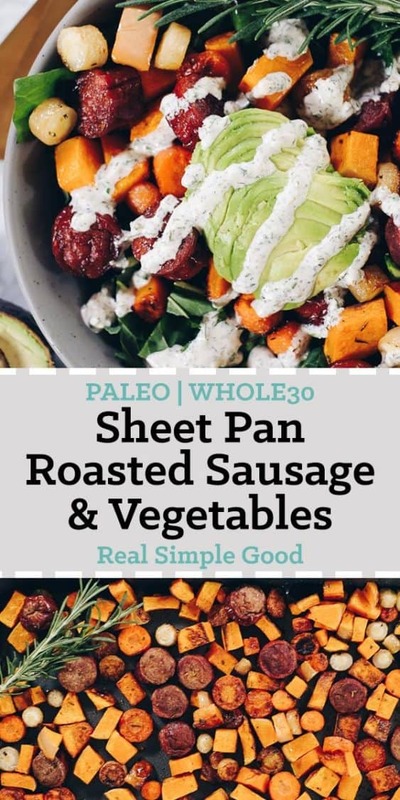 You can use it as a topping for this sheet pan sausage and vegetables dish, and then use the leftovers to dip veggies in. 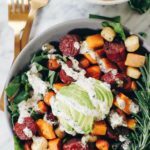 Well, of course the next best part after the creamy ranch all over the roasted sausage and vegetables is that while we originally made this recipe as a breakfast, it can really be enjoyed any meal of the day! And if you’re like Justin, you can even add some eggs on top. Our favorite is either fried eggs or poached eggs so you get all the runny yolk goodness. Soft boiled would be yummy, too! Looking for other egg-free breakfast recipes? We know that finding egg-free breakfast options can be a challenge. Because of that, we put together a round up blog post for our readers featuring 30 Whole30 Breakfasts Without Eggs. Hop on over now to check out a great list of other completely egg-free healthy breakfast options! Looking to mix up your breakfast routine, or just want an easy sheet pan meal? Give this roasted sausage and vegetables recipe a try! Let us know how it goes by leaving a comment below. Also, take a pic and tag us on Instagram @realsimplegood, so we can check it out! Preheat oven to 400° Fahrenheit and line one large or two medium-sized sheet pans with parchment paper. Prep veggies and sausage as noted, and place veggies in a large mixing bowl. Add melted ghee or avocado oil, rosemary and sea salt. Toss to coat. Then, spread out on sheet pans(s) in an even layer and add sausage to pan. Place in the oven to roast for 30-40 minutes, until squash is tender. 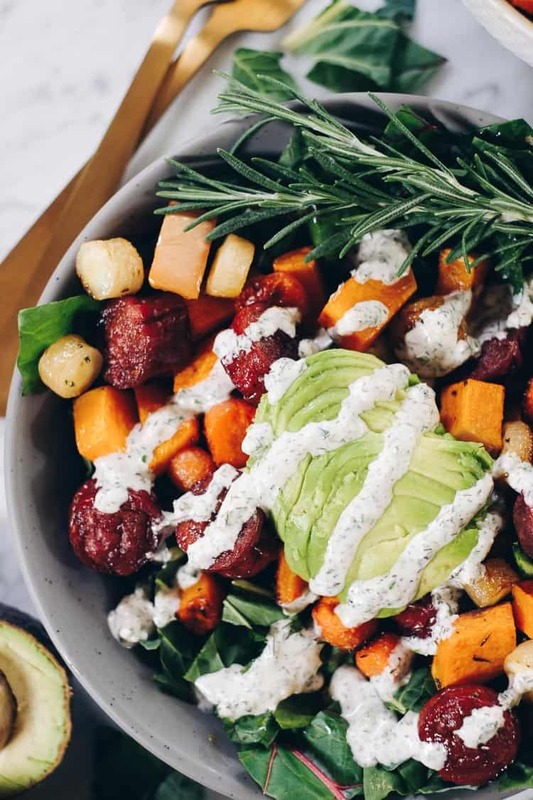 While sausage and veggies are roasting, make ranch dressing. 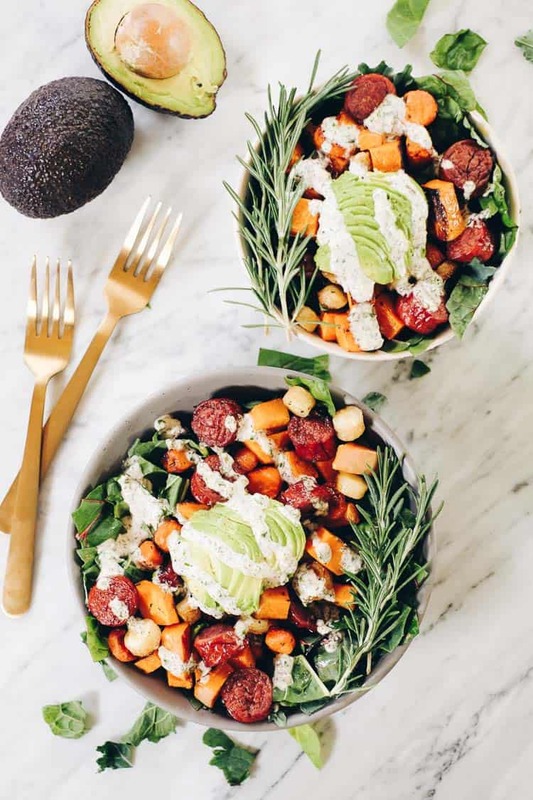 Place all of the dressing ingredients in a bowl or jar and whisk until creamy. Refrigerate until you serve. Also, while the sausage and veggies roast, prep greens and avocado. Once squash is tender, remove sausage and veggies from oven and make bowls. Start with a bed of greens and layer on sausage and veggie mixture. Top with ranch and avocado. Enjoy!